Since the moment Liz first came through our Long Beach door, we knew how special she was. Her initial appointment, she worked with the lovely Yulina, and brought in all her family. Elizabeth is very family oriented, and so loving and caring towards each person in her family. Her 7-year-old sister came to her appointment and thought Liz looked wonderful in the dress she chose. 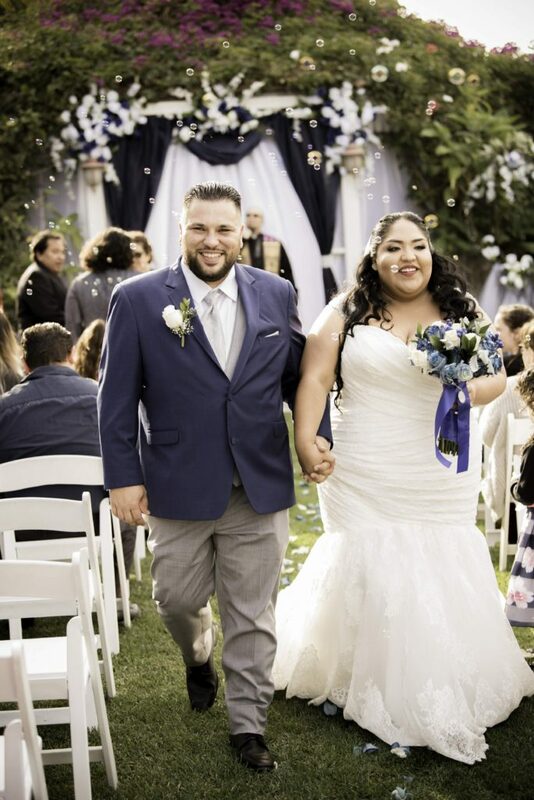 We found out that a picture was taken of her face when Liz walked out of the fitting room in her dress, with her mouth dropped looking absolutely awed! 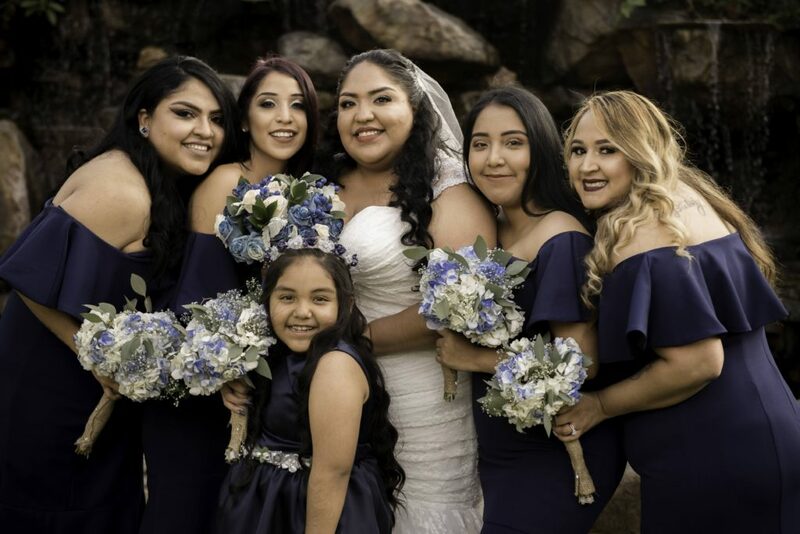 Her sweet sister even tended to her train immediately before she walked down the aisle in her ruched mermaid wedding dress. So adorable! 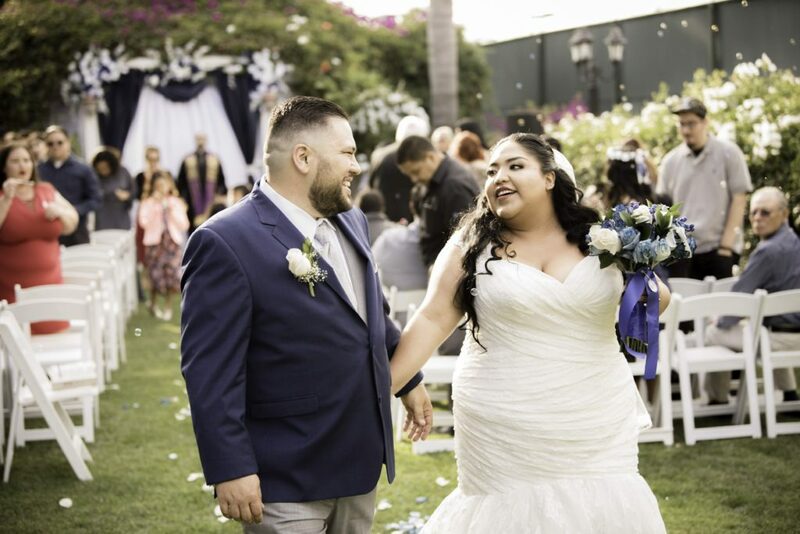 Liz and Luis got married at the Southend Raquet and Health Club in Torrance, California. This venue is marvelous, with its waterfalls gracing the entrance, flower-filled gazebo, and beautiful ballrooms. The couple had their ceremony outdoors at the garden in the early evening, while the reception was indoors at the same venue. Let’s talk about her dress, which looked incredibly stunning on her. The gown is a fit n flare styled dress, featuring English netting and timeless ruched laced. She looked so fascinating in this combo, and the colors of her wedding complimented her perfectly. Her bouquet, she added a pendant of her great grandmother who passed away. This melted our hearts. The whole party looked fabulous, supporting Liz and Luis on this very important day. When we got a chance to talk to Liz post wedding, we got to talk about all the magic from the day, and even hear some funny stories. Liz shared that she initially was supposed to arrive at the venue around 4, but showed up around 530 because the car she was traveling in wouldn’t start as they were leaving. Elizabeth’s family pulled together and hustled to finish setting up and helped Liz, which made everything workout perfectly. The close bond between this family is so beautiful. It was so great to hear how awesome the wedding played out for this couple. 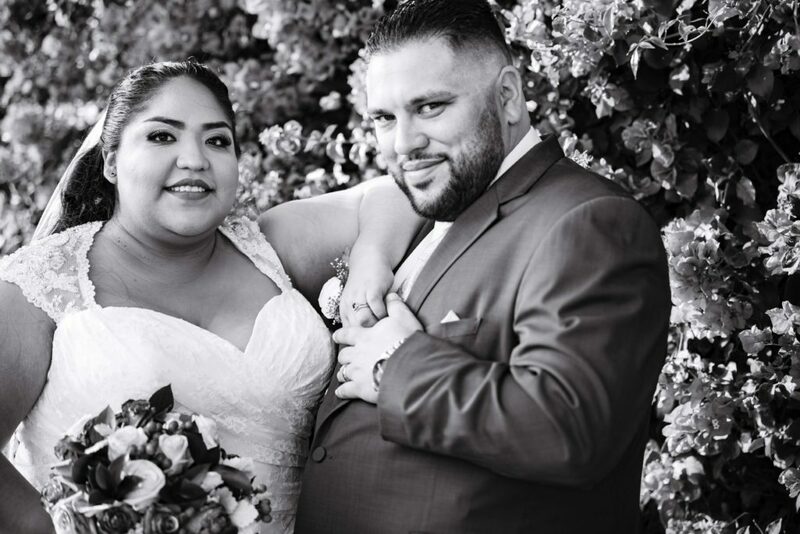 We wish Elizabeth and Luis our very best and are so excited for this new path in their lives. Congrats!!! 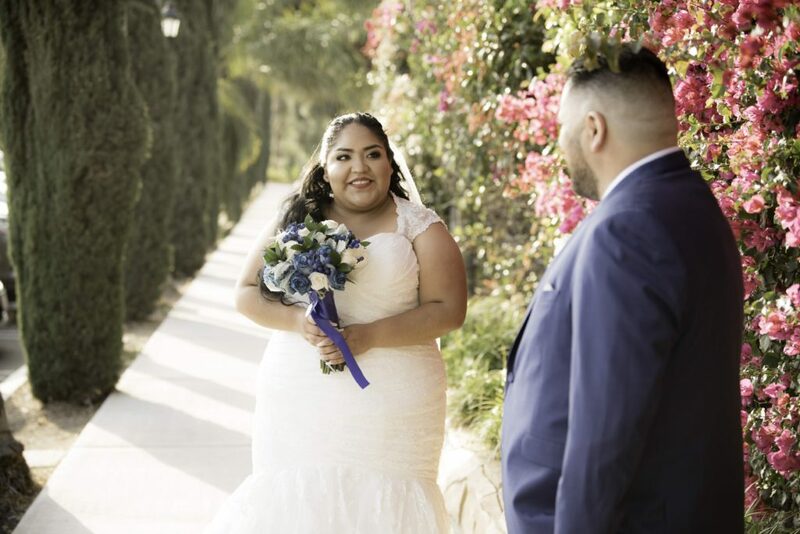 While Liz’s ruched mermaid wedding dress is no longer available in our bridal stores, our Spring 2019 designer collections of plus size wedding dresses have arrived. Book a NEW Private Appointment for the ultimate champagne wedding dress shopping experience! OMG! We LOVE that! She looked incredible. Congrats to you BOTH! !